Custom 3.5 inch diameter circle shape custom full color magnets make a very thoughtful promotional choice for advertisers who cannot afford to invest in a multimillion promotional gifts. A logoed promotional 3.5 inch diameter circle shape full color magnet can be handed out during promotional events such as tradeshows, shopping festivals, investors meet, etc. 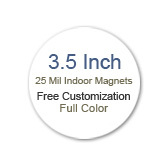 Cosmetically enhanced and personalized 3.5 inch diameter circle shape full color magnets stand higher chances of retention in homes as a fridge art and advertisers can seek full benefits from it in the form of increased sales. Individual businesses, realtors, design studios – are some of the businesses, which can seek favorable benefits from this magnet.